and the front is now flat. The inside will stay the same. and replaced the bearings once so far about a year ago. machine has a new wiring harness and circuit board. We own one of each - old style and new style. To order your Staber washing machine just call us in ARIZONA at 1-928-567-4433. Or just click on item below! Discount for cash purchase is available at this number only!!!. The closer you live to Ohio the lower the final cost! All machines are shipped direct from Ohio. Email us for details (please your include ZIP code so we can compute shipping) at ward@lighthouseenterprises.us So call us today and begin saving right away! Ask for Ann if you would like to hear about how this machine compares to normal washing machines. Ann was very leery of this new style machine. For a while she had two washing machines hooked up at the same time - the Staber and an Amana Commercial grade top loading washer. Call us to discover how they compared. Once your order is placed you can call Staber directly (1-800-848-6200 and talk to Sylvia) if you would like to ask any other questions that you might have or find out exactly when your machine will ship. 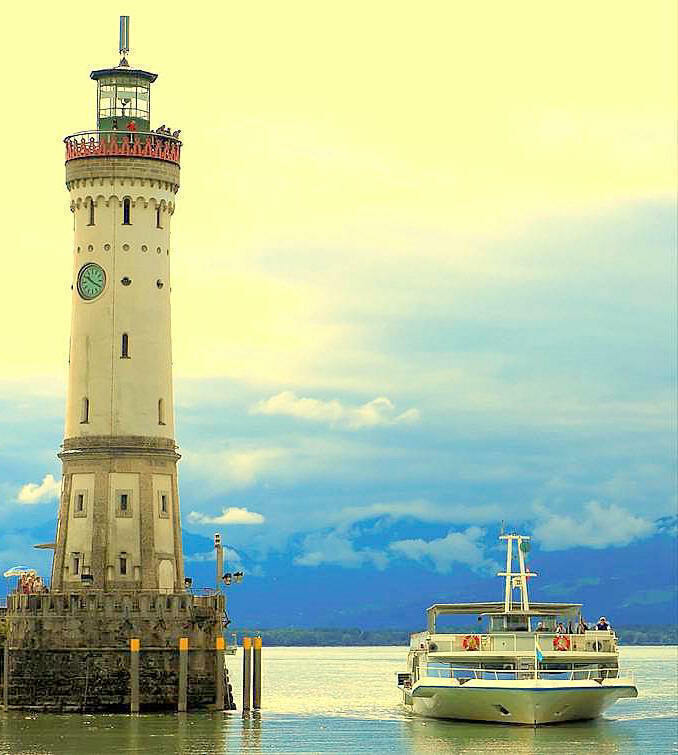 Just tell them that Lighthouse Enterprises is your dealer and they will answer any questions. The way we normally work is this - you call us, we agree on a price, you give us your info and tell us verbally that you want a machine, we place your order with Staber - you then have a firm place in the shipping schedule - you send us a check - we call or email you when your machine ships. You can call Staber anytime after your order is placed and check on the status of your washing machine. Shipping rates are almost going up daily! Please call us for a current shipping quote! A lift gate costs an extra $75 when we can not deliver to a loading dock! Shipping weight is 240 lbs, 175 lbs out of shipping container. each year compared to traditional agitator washers simply by using less resources. model HXW2305, which is a white decal with white knobs. Click here to see how a Staber washing machine works. Click here to read Staber testimonials of satisfied customers. 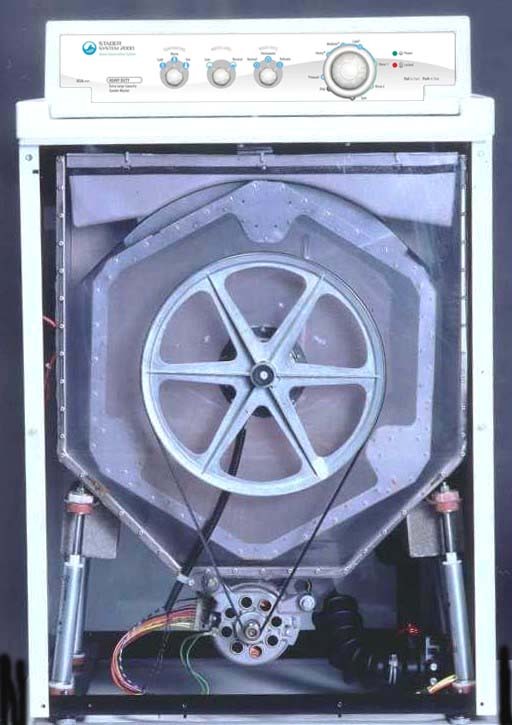 Click here to see inner tub being opened and closed video. How Does Staber Compare With the Traditional Top Load Agitator Washer You May Be Currently Using? Do you want to use around 45 gallons of water per load or around 15 gallons of water? Do you want tubs made of durable stainless steel or tubs made of plastic or porcelain? Do you want to heat an average of 3 gallons of hot water or 12 gallons of hot water per load? At an average of eight loads per week, do you want to spend around $490 each year to use your washer or just $180 with a Staber? Do you want to use 1 ounce of detergent per load with a Staber, or 4-8 ounces per load? Would you like to reduce your drying time by about 30% (and save more energy) by using a Staber that features a much faster spin cycle? Would you like to have total front access to parts and no transmission to reduce your maintenance expenses? Do you want a standard residential domestic washer that will last an average of just 8-12 years or a commercial-grade washer for the home that can last 20-25 years? Do you want your tubs to be circular, or do you want them to be shaped so that they create a passive pumping action in the water to clean more effectively? Would you prefer a heavy-duty four strut suspension to prevent the washer from ‘walking’ in the spin cycle? Would you like to have two re-greasable bearings per shaft, supported on the front and the back of the tubs for greater durability? Do you want your clothes to last around 30% longer because of using a gentle tumbling action as opposed to using a harmful agitator that can shred your laundry? Would you like to use around 135 watt-hours of electricity per load to use a Staber, or around 600 watt-hours to use a traditional agitator washer? Do you want your warranty to be voided if using solar power or not? Even though it still may be working, just think about the costs of using your current washer—it all adds up! You can now see why a Staber washer makes so much more sense compared to a traditional agitator washer. 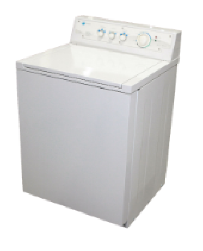 Currently you may be spending over $490 annually to operate your washer if you are doing around 8 loads per week. This gives you close to a 22% or more return on your investment every year you own it. In conclusion, it is a fact you pay utility bills and detergent costs to use a washer. Thus, if you reduce how much money you are spending right now with your current washer you can pay back the entire cost of our washer really quickly. Please call us at 1-928-567-4433. To run on solar - your inverter/converter needs to put out 1500 Watts consistently! 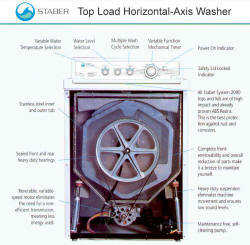 Staber gives alternative energy users the most efficient washer available for handling their laundry needs. The Staber washer runs very efficiently, operating on only 110–150 watt-hours of electricity per wash load. It uses about 5-6 amps during the wash cycle, and surges to about 11 amps when the motor starts. We recommend a minimum of a 1,500 watt inverter to be used with our Staber washer, with adequately charged batteries and an output of between 115-120VAC and 60Hz. to operate correctly. Unlike other washing machine manufacturers, the warranty is not voided when used on a solar power source. 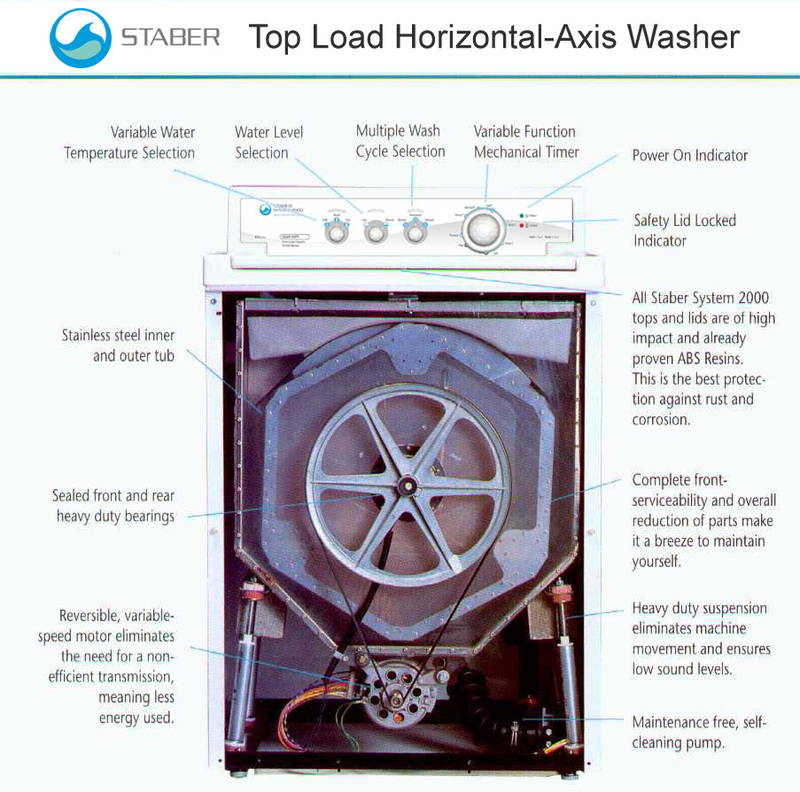 This, while using an average of only 15 gallons of water per load make the Staber the most energy efficient washer available and the best choice for consumers living "off-grid. Notice: These washing machines are not returnable. If you have any mechanical or electrical problems with the washer, the manufacturer guarantees to work with you until you are satisfied. This is a partnership - if you have a problem with your washer, you must be willing to work with Staber (replace parts as necessary) to get your machine up and running. Or at least get a friend who is willing to do what you are unable to do! These machines are very simple to work on and repair! We purchased our Staber in Dec 07 and could not be happier. My laundry is finally clean. Amazing considering the small amount of detergent needed per load. So far we haven't had a problem with the machine and are thrilled. We highly recommend this machine. Thanks Lance and Regis - Received 04/08/08 Just the latest of many! Just wanted to let you know the washer was delivered yesterday, it is hooked up and I am running my 5th load through it since then. I can tell already that this has been a GREAT purchase and I am already loving the washer!! Cool machine!! Looks great and runs perfectly! The entire transaction and went very smoothly --purchase, interactions with Staber personnel and the delivery. Perfect!! You have a satisfied and grateful customer in me!